4-room villa 120 m2, on the ground floor. Comfortable and tasteful furnishings: living room with satellite TV. Exit to the veranda. 2 double bedrooms. 1 room with 1 x 2 bunk beds. Kitchenette (4 hot plates, oven, dishwasher, microwave, freezer) with dining table. 2 showers/bidet/WC. Air-conditioning. Terrace. Terrace furniture, barbecue. Marvellous view of the sea. Facilities: washing machine. Reserved parking (roofed, fenced). 1 pet/ dog allowed. Luxurious villa "Gio", detached. 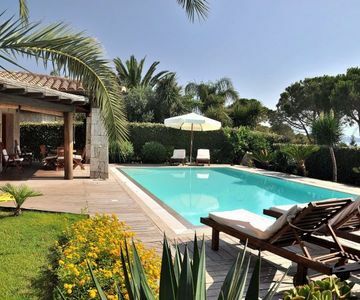 Capo Coda Cavallo, in a quiet, sunny position, 150 m from the sea. Private: well-kept garden 600 m2, swimming pool (05.05.-27.10.). Outdoor shower. House maid daily on request (extra). Shop, grocery, restaurant, bar 500 m, sandy beach "Salina Bamba" 150 m, diving center 500 m. Tennis 500 m. Please note: car recommended. Please note: the villa has open-air jacuzzi on the terrace. Minimum stay: August- monthly (twice a week on request). Luglio - twice a week (weekly on request). The distances refer to the Piazzetta of Porto Coda Cavallo open from late May to late September out of this period all facilities are located in San Teodoro. Cleaning midweek at the service 60 euros.